Our final punch list included things like, caulk around the tub and floor, hang hooks for towels, touch up paint, figure out what was wrong with the water pump, reattach the small back splash on the kitchen countertop, etc. We had several small things to fix and fine tune but there was one major project... The pesky vista windows. I had an idea to somehow have portholes instead of the pill shaped window. We just had to figure out a way to work around the large opening we were left with from the original window frame. Once Dad and Fred saw what they came up with, they talked and made a plan to make it out of wood. It would require very accurate measurements and a whole lot of chisel work but, with Dad involved, we knew it would turn out just right. We ended up stacking 3 pieces of 3/4 inch poplar (that was cut to the size of the inside of the vista windows) on the back side of some 1/2 plywood. Once the glue was dry Dad drilled four 6 inch holes through the plywood and poplar to create our portholes. We origionaly wanted 3 per window but when we realized we could fit four, and reduce the weight of the frame, we opted for four holes instead. 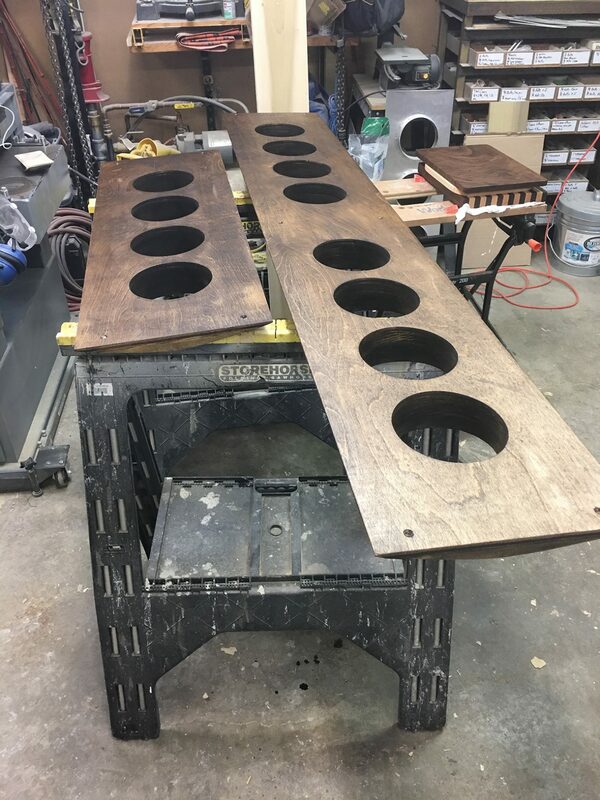 After lots of sanding, planing, measuring, test fitting, and staining, we ended up with some really unique window frames that I am in love with. I’ve never seen it done before and it’s so fun to have something so unique in here. After we put in the window frames to stay, Dad had one last thing on his list! When we installed our water pump and used it, it sounded like we were being shot! The lines were shaking so bad and making so much noise. After lots of research we realized that our water pump was WAY TOO POWERFUL. We had ordered the best of the best and it was WAY too much power for the trailer. So, we ordered another one with half the power and installed it the next day and...problem solved! You should have seen my dad’s face when that was done. He peaked his head in the door with the biggest smile and said...I’M DONE! I think he was a little too excited. At this point, we had been sleeping in the trailer for almost a whole week so that we could get used to it and use things and see if there were any issues we needed to address. So far, so good. Nothing major to fix so we made plans to leave just 2 days later! The day had finally come. It was Thursday, March 16th and it was moving day! We loaded up the truck and prepared the trailer for the journey. We said our final goodbyes, and I tried not to cry (but that didn’t work). We have all been working 6 days a week on this Airstream for just over 6 months. We have poured our heart and souls into this renovation and it was finally done! The emotions were running high. There are no words or things I could do to tell my parents how much this means to us. They opened their home to us for 6 months and let us interrupt their lives. Dad worked so hard on this project. I know he loves a good challenge but this wasn’t just a small renovation project. He basically built a whole house for us in 6 months. Mom helped me with the kids and helped with meals and made fresh blueberry muffins for us! We had so many people pitch-in to help us in so many different ways. We will be writing a separate post about everyone who helped. It’s just amazing to us how many people stopped by to see what we were doing and to offer a hand. Mom and Dad, thank you! You made this happen. Want to see the finished product? Don't worry that's coming soon. We've put a few images up on Instagram, so make sure you're following us over there. We can't wait to give you a virtual tour..